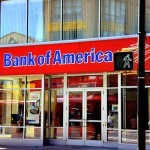 Bank of America beat analysts' expectations for the first three months of 2018 on Monday, posting record quarterly earnings on the back of improved revenues from its consumer banking and global wealth and investment management divisions. The second largest bank in the States in terms of assets saw its net income reach $6.9bn during the quarter ending on 31 March, for a 30% increase year-on-year, helped by a 4% rise in revenues to reach $23.1bn. Instrumental to its record results for the quarter were the recently-enacted tax reforms which saw the group's effective tax rate slashed to around 9%, alongside a 1% decline in its expenses for the 13th consecutive quarter of positive operating leverage, BoA said in a statement. The lender's consumer banking wing improved revenues 9% to $9bn, while loans and deposits picked up 8% and 6%, respectively, leading to a pre-tax income of $3.6bn at the unit, for a 19% year-on-year improvement. Over at BoA's global wealth and investment management businesses, revenue grew 6% to $4.9bn as total client balances increased by $140bn to $2.7trn on a record pre-tax margin of 29%. Profits before at its Global Banking arm on the other hand slipped 2% to $2.723bn, although net interest income was higher. Pre-tax income at the Global Markets division meanwhile was little changed at approximately $2.0bn. At the group level, diluted earnings per share shot up 38% to $0.62. Bank of America chief executive, Brian Moynihan, said, "Our responsible growth model continues to deliver consistent results." "Strong client activity, coupled with a growing global economy and solid US consumer activity, led to record quarterly earnings. We grew loans in our business segments by $45bn and increased deposits by $41bn. We continue to invest in new capabilities in our mobile banking app, the expansion and renovation of our financial centres, and the hiring of additional client relationship professionals. We believe these investments, and our focus on operational excellence, will drive sustainable growth over time," Moynihan concluded. As of 1750 BST, shares had declined 0.37% to $29.69.